This Letter Size Led Artist Stencil Board is used for tracing cartoons, stencils, tattoos, drawings, arts and crafts. 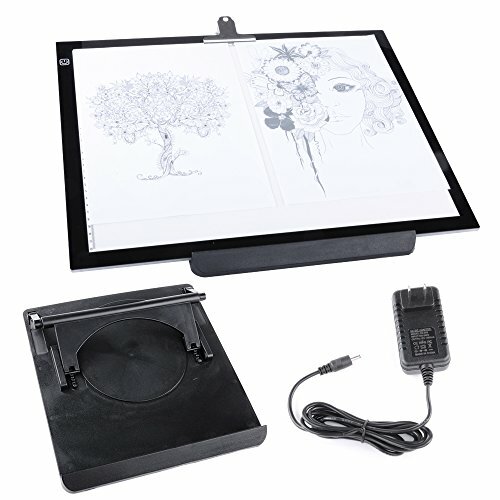 It features adjustable brightness, super slim light board, eye-protective technology, humanized design, which is good for both professional artists or amateurs. Place the board on a flat table in case it drops down and causes damage. At the first time, if nothing happens when you press the switch after powering on, please disconnect the power source and connect it again after 5 seconds, and the IC chip will re-recognize the board, composite memory and start to work. 1.Handle with Care. Do not use sharp metal objects. Protect working surface from scratches. 2.Only use on a safe stable working surface. 3.Warranty will be voided if tampered with. 4.After use always store in a safe dry place. Overall Dimensions(LxWxH):19"x12"x1/3"(A3); Active Area(LxW): 16 1/3"x 13"(A3); Output: 12V; Power: 6 W;Input: 110V/60Hz. Super Slim Design: lightweight, portable and easy to take out; Compared to conventional glass-based panels, the transmittance of acrylic panels has increased by about 20%, but the weight of acrylic panels is only about half of glass-based panels. Eye-protective Technology: Hidden LED design provides enough brightness and diffuse reflection effect by joining the middle tile open honeycomb cushion, which make the light more mild and at the same time, protect user's eyesight. Super bright led lamps provides a perfect illuminated surface. Measuring border to quickly scale your work; Binder clip to hold the tracing paper firmly; Anti-skid feet to keep the led board steady. View More In Light Boxes & Loupes. If you have any questions about this product by Hakutatz, contact us by completing and submitting the form below. If you are looking for a specif part number, please include it with your message.